We have officially survived our first week of homeschool! I have been pleasantly surprised so far. There has been no crying, from Kai or me. Several people told me that someone would cry this week. No one told me exactly why, but with me being pregnant and Kai being 5 years old, I thought crying sounded likely. Yet here we are, one week in and we’ve had zero tears, overall positive attitudes, and we’ve actually been having fun! I thought I would write this post to share with you how we’ve survived our first week of homeschool. I think that we’ve done well so far in part because I had very low expectations. This holds true for anything in life, expectations can really mess up a good thing. I went into this first week of homeschool with the mindset that we are just figuring things out, no pressure for our days to be perfect. I’ve never been a teacher or a homeschool mom before. Kai has never been a kindergartener before. We’re both new. We shouldn’t be expected to know exactly what we’re doing at first. 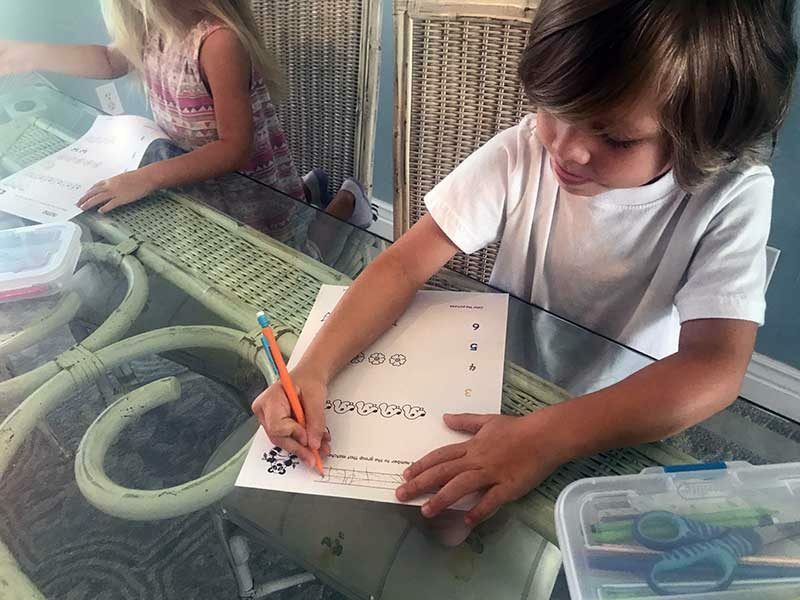 By the way, if you missed reading about why we chose to homeschool, you can catch up here! 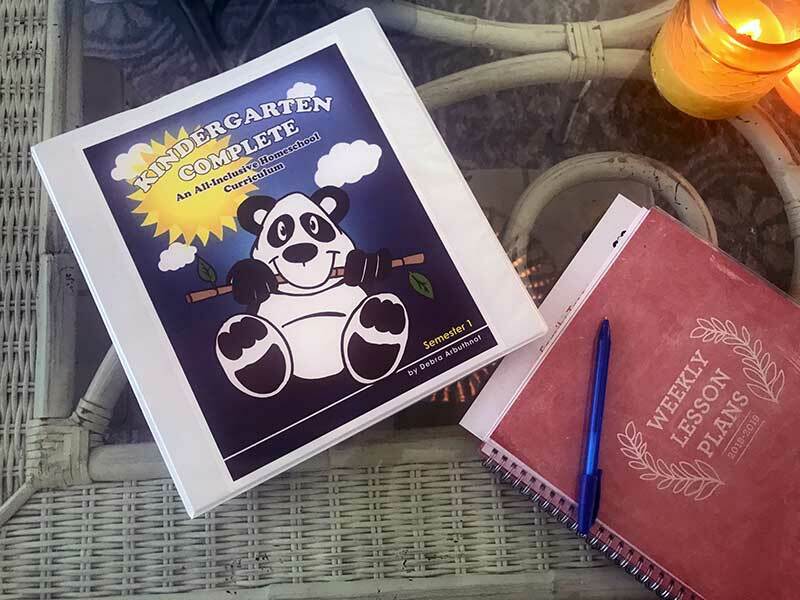 I started by purchasing a curriculum called Kindergarten Complete. Overall, I really want to follow the Montessori style of schooling, but I needed a base for what a kindergartener should be learning. I really love that this curriculum makes it so easy for me. 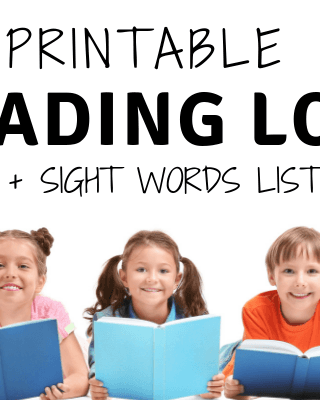 It has full lesson plans, worksheets for each lesson, book suggestions for each week, and really breaks down how to teach each lesson. Zero guesswork, I like that. From there, we can take what he needs to learn and learn it any way we want. I am finding that a lot of the lessons in these beginning weeks are things Kaiper already knows. We were blessed with the most amazing Pre-K teacher on the planet. I take no credit for him already knowing how to reach, write, and do basic math. This week our curriculum is working with numbers 1-5. 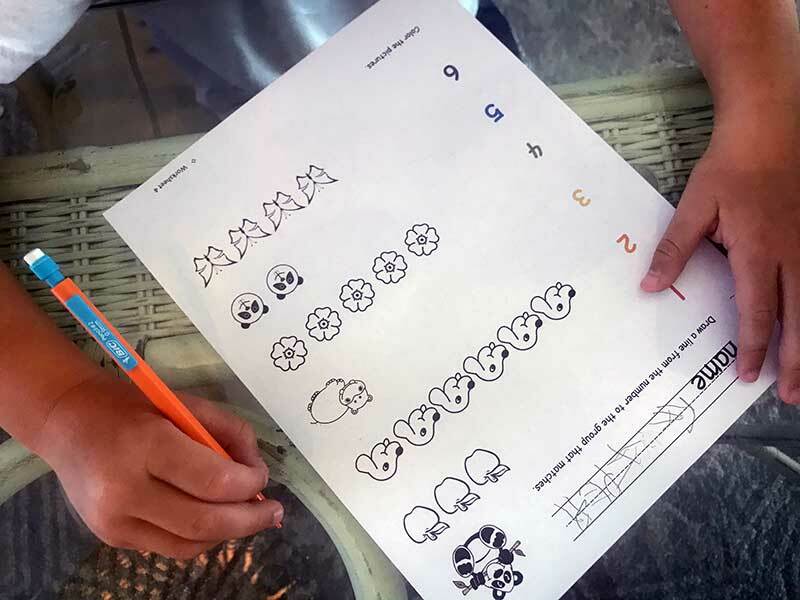 I made sure he remembered them, but then built onto the lessons with addition and subtraction of the numbers. I have been impressed with Kai as he has come up with ideas of his own to extend his assignments in different ways. I love that about homeschool. He can really use his imagination and take his assignments to another level. To be prepared for the day ahead of time, I have been reading through the curriculum’s suggested lesson for the day and writing out my own lesson plans in a planner. You can find a good Weekly Lesson Plans planner here. We have a certain routine we are following daily, which I’ll detail below. Right now I have already planned and prepped through next week. I make copies of any worksheets in the curriculum for the day. I am making copies and keeping the originals because I will most likely use this same curriculum for Alana when she reaches Kindergarten. This also helps in case we need extras because of big mistakes, random spills, whatever may happen. I follow the parts of the curriculum that make sense for Kai right now, and use the other parts to give me ideas. For example, if the math lesson for the day is something he already knows I’ll just change it up a bit to elevate it for him. 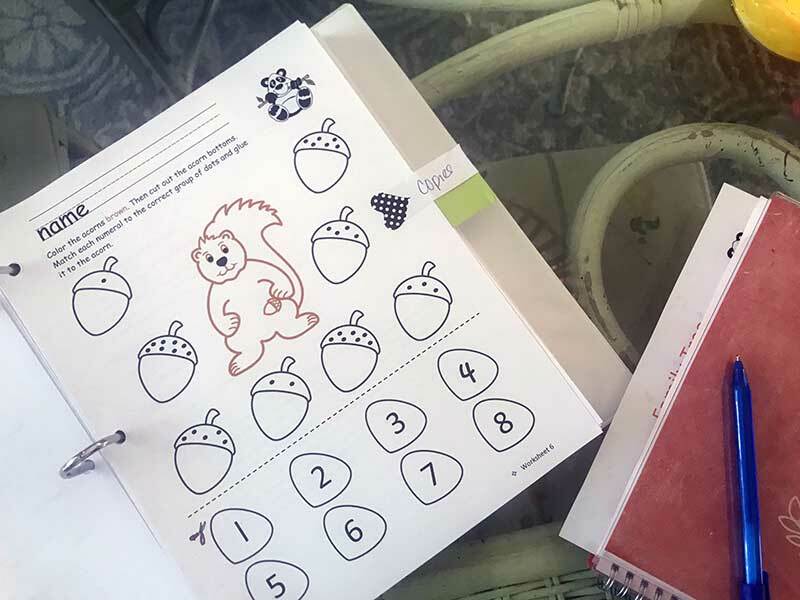 Alana is going to Pre-K 3 on Mondays, Wednesdays, and Fridays right now so we are trying to do all of our sit down homeschool work during the time she is there. On the days she is home, like today, we just incorporate her. 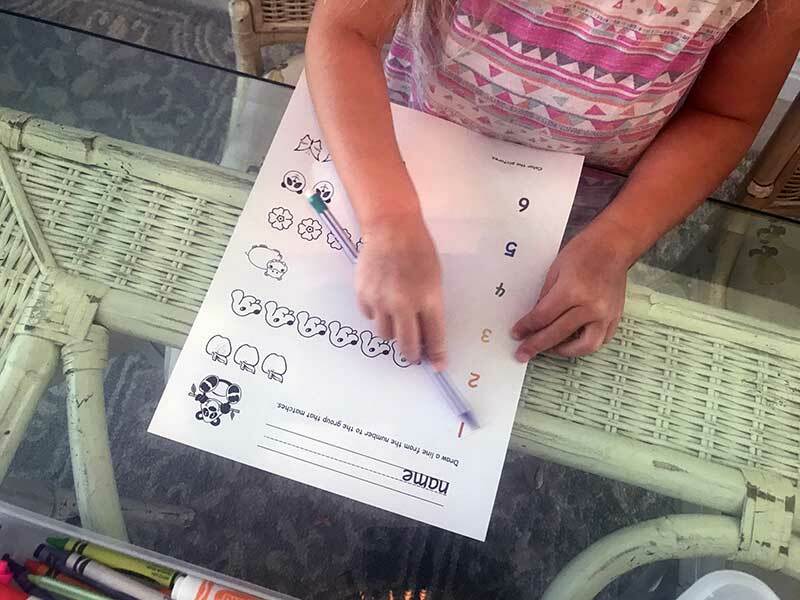 I give her a copy of the worksheets and just give her different instructions that she can follow, even if it’s just to color the sheet however she wants. This has actually helped us be more intentional about having her practice cutting and other fine motor skills. I am not the only homeschool teacher in our family! Chris is excited to be involved in homeschool, so Wednesday he suggested I go out by myself for a while in the morning while he took over homeschool activities. I love that Kai will have that experience with both of us. We definitely have different strengths and weaknesses. We will be starting an Art & Science co-op in September which we are looking forward to. Kaiper also starts a local PE program tomorrow, which he’ll be dropped off at for 3 hours each week. He’ll learn a different sport every 4 weeks. We are pretty excited about that! As we start into these different activities we’ll adapt our schedule. When I say routine, I mean so far. We are in the figuring it out phase, so we are just making adjustments along the way. Breakfast, brush teeth, get dressed and ready for the day. Some days we take Alana to school, and then come back home to start homeschool. Some days we run errands or go for a breakfast date before we come back home. I love the flexibility! I write the day and date on our white-board easel. Kaiper grabs his journal and writes the day and date on the top of the paper. He then draws a picture of anything he wants. He lets me know when he’s finished, and I help him form a sentence to write on the page describing his picture. While he’s drawing, I have been answering work emails and playing the Pledge of Allegiance for him to listen to. He is starting to memorize it by listening daily, and once he does he will recite it. After that we move on to the other projects on our lesson plans for the day. Most everything I can explain to him and then while he works on it I can get back to my work as I sit across from him. So far, it’s been easy to incorporate into my day as a work-at-home-mom. Depending on what our lesson plans are for the day, we’ll then take some time to look through flash cards, play word bingo, or a fun dice game we like to play to practice math and number recognition. As he does his assignments, I was using a 3-hole punch and adding them to his portfolio, until he decided he’d like to do this step too. I just add the date to the top of each paper. Sometimes, there are breaks in between these things. If I notice he’s just not that into it at the moment I’ll suggest he take a break and go find something to play. Then we’ll resume after lunch, for example. Again, love the flexibility. Actual sit down “homeschool” time doesn’t really take that long. We’re going to incorporate outdoor activities, starting tomorrow with a nature walk where we’ll collect some things for next week’s projects. We also read books in the evenings, and throughout the day I’ll ask Kai to find things around the house that start with the letter we talked about that, and so on. He helps me cook, does chores around the house, and has time to entertain himself and be creative. He started making bracelets and necklaces this week on his own during that time. As I was sitting with my coffee yesterday morning trying to wake up, Kai jumped out of bed, sat down at the table and said “Can we start homeschool stuff now?!”. It’s safe to say he is enjoying it so far! He also started Martial Arts and will be back to soccer next month. Setting up a pencil box for Kai (and one for Alana so she feels included) so he has what he needs in one place and can easily access it himself. He can also easily drop it in his backpack when we go to co-op or to do schoolwork at the park. We use this one for markers and crayons, and a smaller clear one for his pencils, erasers, and scissors. We have one set of shelves where I’ve set up paper, constructions paper, a bin of our flash card sets (labeled in ziploc bags), Kai’s journal, pencil box, etc. These are the things we use and need to access daily, all in one place. I also keep his portfolio and my lesson plan books here. On a separate bookshelf, I used to the top shelf for baskets of extra supplies. I stocked up on a BOGO sale at Publix this summer, so we now have a basket of glue and glue sticks, a basket of pens, pencils, highlighters, permanent markers and dry erase markers, and a shelf full of notebooks and paper. I use the top shelf so little hands don’t help themselves to things like glue and permanent markers. My Weekly Lesson Plans book has been a huge help in being prepared ahead of time and making notes. We’re using a simple binder for Kai’s portfolio of work. I’ll be creating a cute cover for it soon. One week in and we are certainly not pros yet. We are having fun though, and that’s most important. As long as I continue to see Kai excited to learn, I will feel like we are doing really good. I’ve also been inspired by this new homeschool journey to use my degree in Graphic Design to create some of our own materials. I’ll be sharing those with you here as I create them! If you have questions, suggestions, or want to be my new homeschooling mama friend, please leave a comment! 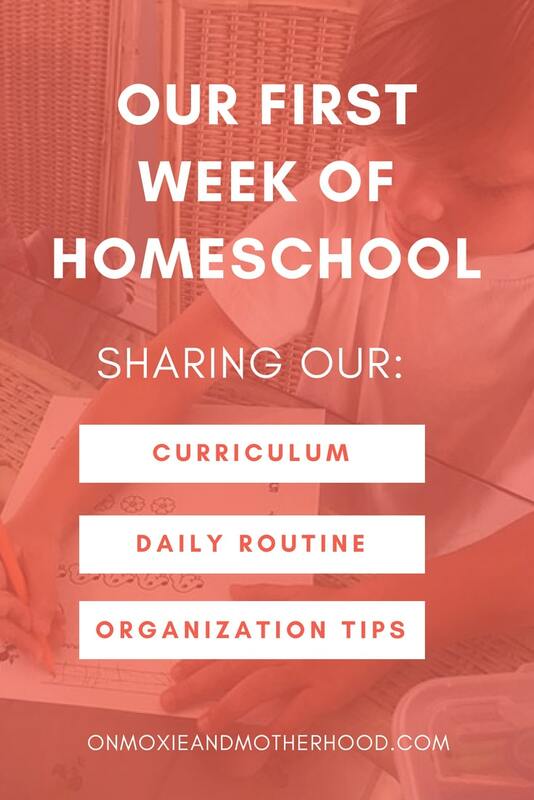 If you’re interested in following along with our homeschool journey and being notified when I share homeschool materials, subscribe to my mailing list below! 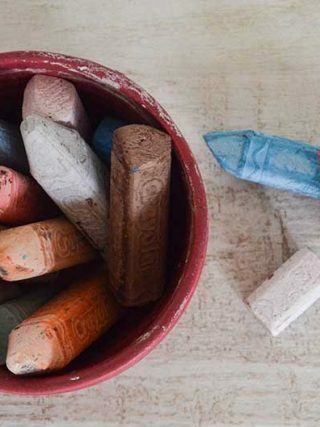 This is such a great resource for parents who are thinking about homeschooling. It is not for the faint of heart! Thanks for sharing! Thank you! We are really enjoying it so far!